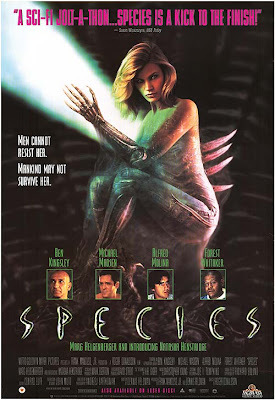 Released 15 years ago today, on July 7, 1995, was Species, a mediocre sci-fi film remembered mostly for bringing the generically hot Natasha Henstridge to the attention of cinema-goers. You'll recall that Ms. Henstridge played Sil, the result of a scientific experiment gone horribly awry. Scientists, who have received a extraterrestrial radio transmission from outer space containing instructions on how to splice alien and human DNA, produce a human-alien hybrid, who ages very quickly, and ultimately takes the form of Ms. Henstridge. We must have been somewhat impressed by the premise - or Ms. Henstridge's looks - as the film reportedly made $119 million at the box office (at least according to the Wikipedia). Oh, my. 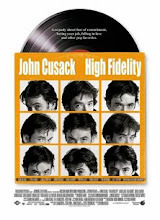 I seem to remembering renting this one sometime later in 1995, but who knows? The fates have been cruel to the career of Ms. Henstridge, who has done very little of consequence since the mid-1990s. She certainly seemed to impress the residents of my dormitory in mid-1995, though, but fifteen years later, she's been replaced a dozen times over by whoever Hollywood elected to be the next shining young ingenue. Oh, well. Such is life. Interesting, Species spawned a theatrical sequel in 1998 and a direct to video sequel in 2004. Then, in 2007, producers attempted to revive the "franchise" with the awful sounding direct to video Species: The Awakening (which is surely something The Signal Watch should be called upon to review at some time in the not too distant future). Wanted to watch this when I was 13, mostly because I knew she got naked. Naked women were much harder to come by in 1995. I did see this one in the theater. I believe I saw the movie the same week I saw "Judge Dredd". I recall a lot of disappointment. After seeing "Birdemic" twice in the theater now, I really have no moral high ground to turn my nose up at a direct-to-video movie and fourth in a series (but won't I get lost having not seen installments 2 and 3? ).